Patrick Shaw sat down with Tom Marks of IGN to show off some Star Control: Origins! Check out the first look video and let us know what you think. Damn. The game looks really good. I especially love the slow pace while navigating a star system. It's so nostalgic and heavily reminiscent of SC2. I'm excited hear more of Riku's music as well. Anyway, can't wait for this game. Like I've been saying, it looks like it was made by people who loved Star Control 2, and that's exactly what I want out of a reboot. Oh, my, yes. Only criticism: not a huge fan of the landing zone thing for the planet. Oh, not because of the mini-game; that looks nifty enough. It's the fact that it looks like you can't choose your landing site, like you make planetfall where the game decides. Maybe I'm wrong, and we just didn't get to see the selection process for that...but you'd think--realistically, anyway--that'd be something the player could choose. Other than that, yeah...can't wait. Are you a professional 3D designer? I worked in games back in 2001, did a thing or two for indie flicks, but mostly just my own work, for fun and for my YouTube channel. So, if you wanna be technical, I suppose the answer is 'yes'...but I'm not sure how much YouTube counts as 'professional' (even though I do get money from it). I know that is not possible for everyone as the glasses are rather pricey. Frogboy, will there possibly be a Colorblind enhanced skin or something to help folks like fruitcake? Wasn't there a quest indicator, though? Direction-pointer? Very valid point, maybe they can put in a hover over tooltip box with a bit of info for situations like that. I like the UrQuon and Spathi ship models hanging in the background. The real question is what does Wymdoo think they are and where did he get them? I just noticed there aren't any RUs recovered after the Earthling Cruiser(?) destroyed the Scryve scout. Can't you gain RUs from fighting anymore? Also, I don't mind the landing mini game, but I wish you could land anywhere on the planet instead of the fixed spot the game assigns automatically. I just now realized what bothered me with the Tywom alien model and why it feels too familiar and Pixar-y. The eyeballs. I think it would be better lore-wise if it had unconventional less-cartoony eyeballs. A feline-eye? A reptilian eye? Thraddash eyes? Come to think of it, almost all aliens in SC2 had unconventional eyes, except for the Umgah, from what I can recall. QFT. Totally my objection as well. Have to admit, the characters in SCO do look kind of cartoony. Granted, they were slightly cartoonish in SC2, as well, but if we have a scale of "cartoony" on one end and "uber-realistic" on the other, SC2 is kind of in the middle, leaning slightly to realistic, while SCO is more halfway to cartoony from the middle. I don't mind, exactly, and it's probably way too late to change it...but I kinna wish it weren't so. The early aliens you meet are pretty cartoony. Look at that. Aren't they cute? Maybe this is a kid's game even? Spore. This is like Spore. It's a friendly game. Fun. Cute....oh...what are those? What the hell are those? Oh my god! OH MY GOD! We may end up having to reveal some of the later species to dispel the "cute" issue but I hope we don't. And I'm going to be playing this game, cute or not; nearly everything I've seen, I like...and for nearly everything I don't like, I'm told that the improvement I expect is coming, or that my interpretation was incorrect and what I was hoping for is actually in there already. Hurry up and finish this bloody game already! I wanna play! I don't understand why people are so hung up on the "Cartoony"
back in 2004 A game called World of Warcraft was derided and mocked for having simplistic cartoonish animation and characters... the game everyone just knew was going to be worth playing was the Ultra-realistic Everquest 2.
and heaven for bid something look like Pixar films, as those are pretty much sure bets to make money and be loved by people of all ages. Give me a story worth watching/reading and i'm going to watch/read/play the heck out of it and I don't care what it looks like or how it is delivered. I only care about the enjoyment it brings me. to quote Gladiator, "Are you not entertained?" pretty sure from what i've seen so far, I will be. Well, it helps take a game seriously. Or at least, more seriously. It lets us know the developers are taking us seriously. Maybe that's a bit unrealistic, and I freely admit that it's a visceral thing rather than logical but that doesn't mean it's not still there. Not sure that's really a fair comparison, given that the games themselves are kinna different. I actually never played either of them...or at least, not for particularly long; I was never a fan of Snorecraft, and I played EverQuest 1, but never 2. But there are definitely times when a game's look is cartoony and I wish it wasn't. I remember the first preview I ever saw of Spore (https://www.youtube.com/watch?v=T8dvMDFOFnA), it looked like they were going for a certain amount of realism; not completely, but still...I was really looking forward to it. And yet, when the final game came out, it suddenly looked like Disney, certainly in comparison to the preview...and I was rather disappointed by that. Those are also the only all-CGI movies we ever really see. That's not a fair comparison until we see what happens when there is a CGI flick that looks more like, say, GI Joe or Transformers rather than Looney Tunes, and isn't trying to make kids laugh the whole time. Well, I'm an animator and have worked in games; the aesthetics do matter to me. They matter to a lot of people. The way something looks is part of the entertainment. 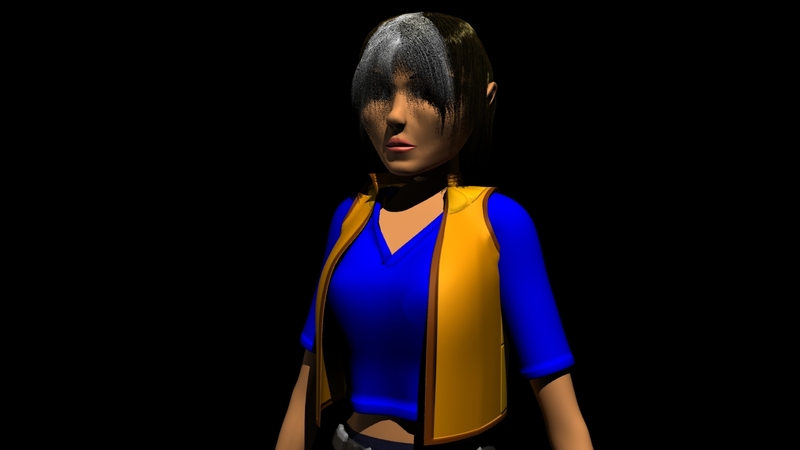 that said, as an animator what are your thoughts on the uncanny valley? I have a background in Linguistics and don't even get me started on how irritating things like "irregardless" or "hey can you borrow me that thing?" are to me. Well, I promise to you that you'll never hear--well, read--that kind of drek out of me. I usually do my best to get the grammatical order correct even when it's obviously a bit awkward, and I always, always, always use an Oxford comma. I used to be guilty of it; I was attempting to find a middle ground between realistic and anime-style once, and the eyes came out creepy-as-hell. I've learned my lesson, since. There is no reason it must take up more processing power if it were more realistic; a character only needs to be modeled differently, which can be accomplished without extra geometry if done correctly. Now, now...non-sweetened is in the dictionary. (I checked). Oh. Right. Visual design. Cartoony vs realistic. So, realistic... what level of realism would you desire? As an animator what changes would you feel would make it more real without increasing the polygon count or using fancy lighting effects etc? Well, it's really just a design thing: make the eyes less round and goofy, maybe make the colors not quite so vibrant, give them a bit more texture, a little more messiness. I mean, it doesn't take more polygons just to make the shapes different. I really really really wish there isn't any hand holding in this game. The arrow at the edge of the screen when navigating to the destination planet does not bode well for me (at least). In SC2, I like the mechanic that you had to search through all the planets in a star system if you forgot what planet number you were supposed to visit. It seemed tedious, but it lets players discover that it is in fact nice visiting planet to planet especially when you stumble upon ruby/auric worlds. The mining gameplay easily took over a chunk of my time in Sc2 and it was hella rewarding since I was able to upgrade my thrusters, turning jets, cannons, etc. I wish that aspect of Sc2 is intact in Origins.